Impact Design & Print Ltd are a design & print company based in Basingstoke – they do exactly what they say on the tin! They needed space to cope with their continuing growth and wanted to utilise the available space within their existing building rather than go through the costly alternative of relocating to larger premises. 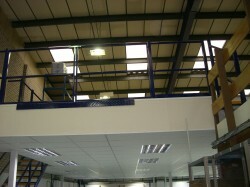 A mezzanine floor therefore appeared to be the answer. Impact had seen how another printing company nearby in Reading had benefited from a Hampshire Mezzanine Floor and so they decided to contact Hampshire Mezzanine Floors for a quote. HMF carried out a full survey of Impact’s existing building and provided three initial options for different sized mezzanine floors. After consultations with their landlord and their bank Impact decided to go with the largest option mezzanine floor which provided them with space for their future growth. 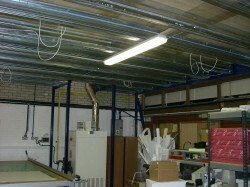 The size of the mezzanine floor meant that the floor would require full 1 hour fire protection which HMF also supplied. HMF undertook the task of administrating the Building Regulations application to seek approval for the entire project and also liaised with Impact’s landlord to gain consent for the project. A key criterion was that this was a free standing structure not attached to the walls and was a stable structure as required by the BRE Digest 437 legislation. The mezzanine floor provided over 166m² of floor space and yet maintained a clear area underneath by using large steel section beams to minimise the number of columns required. 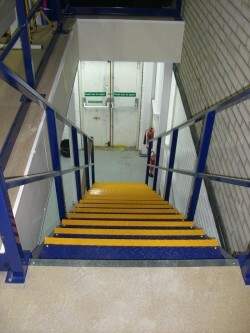 Two new staircases were also supplied and a hand and knee rail with integral kick plate was fitted around all of the perimeter edges for health and safety purposes. A large swing gate was installed to allow the client to get large print displays up onto the new mezzanine floor. The bright White 1 hour fire resisting ceiling tiles fitted under the new mezzanine helped to create a very light area below the mezzanine floor. Recessed modular lighting was fitted into ceiling voids along with 1 hour fire resisting fire hoods over the lights to maintain the integrity of the fire resistant suspended ceiling. 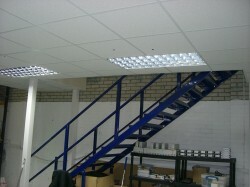 The mezzanine floor was installed over a weekend to minimise any disruption and was completed in just 2 days. The fire protection was fitted at a later stage to allow Impact time to reposition printing machines and get production rolling again. These works were carried out during normal hours working around Impact’s staff and machinery. The benefit of this added space to Impact has been enormous giving them more room to lay out and print large displays, provides a demo area for mock ups and additional storage space and packing areas, as well as the possibility for future office expansion. The whole project was completed on time and on budget and hopefully this will keep Impact Design and Print Ltd satisfied for a few more years as they were able to remain in their existing premises and even sign a new lease based on the additional future growth that mezzanine floor solution provided.